Zakaria Barakzai was born in 1968. He has been graduated from Al Birooni High School in Kandahar. He has received his Masters Degree in international relations from Moscow State Institute of International Relations(MGIMO). 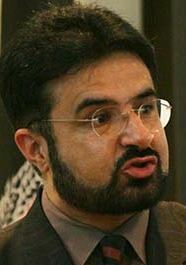 Prior to joining the Independent Election Commission of Afghanistan (IEC) he worked as Managing Director of “AfBel Joint Venture”, Minsk, Republic of Belarus, Managing Director of “S and Z Trading Co. LLC”, Dubai, United Arab Emirates, Legal Advisor to the Minister of Public Works of Afghanistan, served in the Consulate Directorate of the Ministry of Foreign Affairs, the Head of the Legal Department (counterpart) of the Joint Electoral Management Body (JEMB) during 2005 election in Afghanistan. He is author of number of publications on Afghanistan foreign policy and international trade relations. He observed many overseas elections and was the head of IEC observation missions to General Elections in Australia 2007. In 2008 he participated in the International Visitor Leadership Program in the United States. He is the founder and elected chairman of the Association of Electoral Officials of Afghanistan (AEOA). Barakzai speaks Pashto, Dari, English, Arabic, Urdu and Russian.